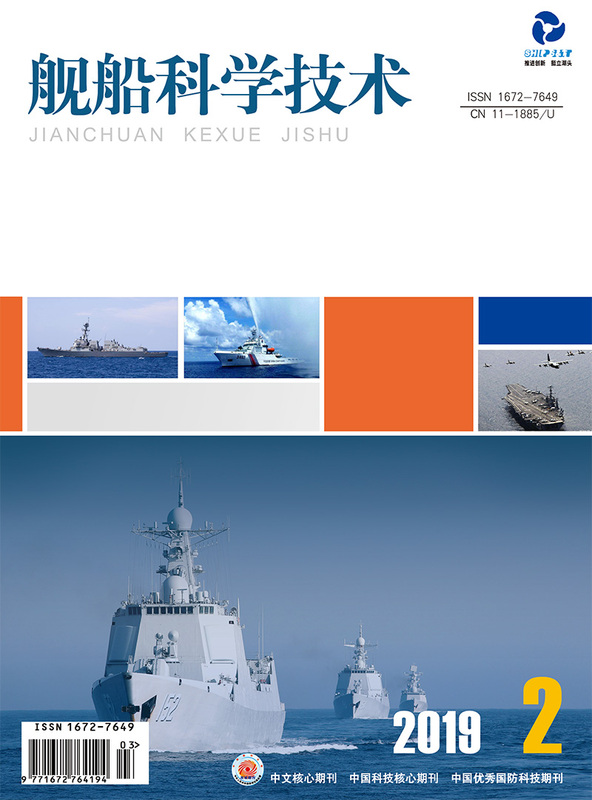 英文摘要：The application environment of hydrodynamic and low frequency noise attenuation techniques in naval vessel is analyzed at first in this paper, which points out the characteristics of sound propagation and excitation, requirements of safety and size in sea water piping system. Then, hydrodynamic and low frequency noise attenuation techniques, including traditional reactive silencer, gasbag silencer, elastic plate silencer and ANC, are analyzed in detail. The advantage and disadvantage of all kinds of these techniques is presented in this paper, which indicates the work to be carried out in the future. YUAN S Q, YANG J, YUAN J P, et al. Experimental investigation on the flow-induced noise under variable conditions for centrifugal pumps[J]. Chinese Journal of Mechanical Engineering, 2012, 25(3):456-462. GORIN S V, KUKLIN M V. On the operating efficiency of helmholtz resonators in deadend waveguides using fluid working media[J]. Acoustics Physics, 2012, 58(3):363-367. GORIN S V, KUKLIN M V. Reducing low-frequency vibration in hydraulic systems by means of Helmholtz resonators[J]. Russian Engineering Research, 2010, 30(5):493-495. JI Z J. Acoustic length correction of closed cylindrical side-branched tube[J]. Journal of Sound and Vibration, 2005, 283(3/5):1180-1186. SELAMET A, LEE I. Helmholtz resonator with extended neck[J]. Journal of the Acoustical Society of America, 2003, 114(4 Pt 1):1975-1985. HUANG L X. A theoretical study of duct noise control by flexible panels[J]. The Journal of the Acoustical Society of America, 1999, 106(4):1801-1809. HUANG L X. Modal analysis of a drumlike silencer[J]. The Journal of the Acoustical Society of America, 2002, 112(5):2014-2025. 汉森C H,斯奈德S D.噪声和振动的主动控制[M].仪垂杰,译, 北京:科学出版社, 2002:1-4. BRéVART B J, FULLER C R. Active control of coupled wave propagation in fluid-filled elastic cylindrical shells[J]. The Journal of the Acoustical Society of America, 1993, 94(3):1467-1475. BREVART B J. Active control of coupled wave propagation in fluid-filled elastic cylindrical shells[D]. Virginia:Virginia Polytechnic Institute and State University, 1994. KARTHA S C. Active, passive and active/passive control techniques for reduction of vibrational power flow in fluid filled pipes[D]. Virginia:Virginia Polytechnic Institute and State University, 2000. KIYAR M B. Active/passive control of fluid-borne and structure-borne disturbances in fluid-filled piping systems[D]. Virginia:Virginia Polytechnic Institute and State University, 2003.